Of the numerous short, narrow canyons that cut through the southeast corner of the San Rafael Reef, the most visited are south of Temple Mountain Road, especially Crack/Chute and Bell/Little Wild Horse, the latter accessed by a newly paved road. Those to the north are harder to reach and so less visited; North Fork of Iron Wash is one example, quite deep, remote and containing several dryfalls. But the narrows of Farnsworth Canyon are much simpler to explore, having no obstacles, just a flat, pebbly floor through passageways bordered by angled, thin-layered strata of Navajo sandstone. The enclosed section opens out after only 1/4 mile to a wider gorge filled with large fallen boulders, and eventually meets the track to the Temple Mountain uranium mining district, but to see the narrow part takes only half an hour if driving all the way to the entrance, or about 1.5 hours if walking along the approach road, since this has one wash crossing near the start which may stop 2WD vehicles. 12 views of Farnsworth Canyon. Topographic map of Farnsworth Canyon. The track to Farnsworth Canyon forks north off Temple Mountain Road just west of the junction with the turnoff to Goblin Valley State Park. The surface is generally good but after one mile the road descends an uneven, rocky slope and crosses a seasonal wash, filled with deep, soft sand when dry, so a 4WD vehicle may be needed to continue. The next 1.5 miles is fairly level, with no more difficult places, passing a low mesa to the east then crossing more open lands, as the target drainage approaches to the west. The wash crosses the track soon after the Farnsworth Tanks, a collection of transient pools. 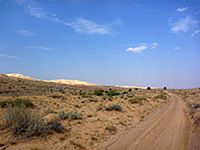 The road continues past Old Woman Canyon and later meets UT 24, while before Farnsworth (the sandy streambed) is North Temple Wash, which provides a route for another 4WD track. None of these canyons is particularly narrow. There are many good free camping places in the vicinity, along the access road and the slightly busier Temple Mountain Road. 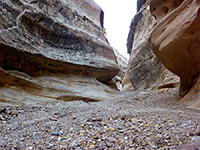 The lower end of Farnsworth Wash is sandy, but is soon enclosed by attractive, stripy, undulating, light-colored slickrock; this merges with the high cliffs marking the edge of the San Rafael Reef. 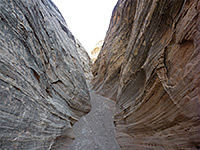 The drainage then adopts a narrow V-shape, about 6 feet across at the most enclosed sections, and as with the majority of such canyons hereabouts has walls of thin-layered sandstone, angled at about 45°. The passages look best when walking upstream. The rocks are variously orange, light brown or pinkish in color, and quite pretty. 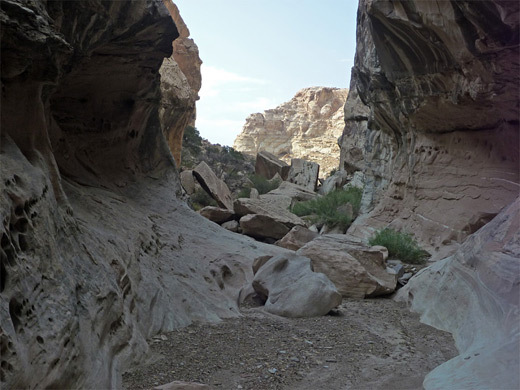 The slot opens out after just 1/4 mile as the cliffs separate and grassy sandbanks rise up around the streamway; ahead are boulder-covered slopes and, in the distance, the flat lands of the central San Rafael Swell. One option for an extended trip is to continue along the canyon for another mile, veering up an east-side tributary drainage just before the inside of the reef; in the upper end of this canyon are two arches and a natural bridge.